PEJ News - C. L. Cook - What does nearly a billion dollars per annum buy on the Canadian media market? If you're a Canadian taxpayer, what you get is: C.B.C. - Radio Canada. For decades of Canadians, that has seemed good value, considering the dismal performance of the commercial alternatives; especially when it comes to covering news. But, in light of the overall decline of the quality, and quantity of the C.B.C. 's television news service, it's perhaps time Canadians reassessed their enforced investment. "ISRAELI POLICE and PROTESTERS CLASH OVER BARRIER in JERUSALEM" the latest State media banner blares. Yes, the great wall of Israel continues to snake it's way throughout the region once known as Palestine, rending families and infrastructure as it goes, all without so much as a "by your leave" from the steel-fisted rulers of the Holy Land. It's been an ongoing story: Palestinian villages: schools, farms, businesses, and homes torn in twain for the comfort and security of distant Israelis, and enrichment of the few. A theft in broad daylight hardly mentioned in the C.B.C. Here's a sample of their online coverage of this massive injustice to the Palestinian people, and blasphemy against one of the world's most important historical cities. "Is it legal?" is the rhetorical question posed. And the answer? "According to the Supreme Court of Israel - Yes." Well, that's O.K., I suppose. Moving along. There have been uncounted protests within Israel and the Occupied Territories over the wall. Some are covered in the Western press, most are not. But, when they are covered, they're given the treatment, standardized as in the C.B.C. piece attached below: On its face, a cool-eyed media assessment, revealing no bias, but a nearer look is revealing. "Ten of the activists on Saturday were arrested for disturbing the peace, Israeli Army Radio reported." the C.B.C. records without remark. Is this as close to the action the C.B.C. intrepids in the field can get? Consider that, Canada: The news you're getting from Jerusalem is coming straight from the mouth of the Israeli Army. These are the guys doing the killing, now telling you "ten of the activists on Saturday were arrested for disturbing the peace." If you checked out the photo, what you saw was an image of what passes for equality in Palestine/Israel. You see a handful of young Semitic-looking males in the distance, photographed over the shoulders of anonymous soldiers, who are levelling their M-16 rifles at the unarmed youngsters. The photo informs (courtesy C.B.C.) that this is a "clash" between "activists" and "police" in the town of Bil'in, yesterday. Their "activity" seems, from the vantage of the camera, to be limited to the classic "hands in the air" gesture that speaks not a thousand, but two words: "Don't shoot!" Speaking to a rally of "activists" protesting America's war against Vietnam, legendary "activist" historian, Howard Zinn said of the riot act just read to them all: "They are not worried about you "disturbing the peace," because there is no "peace" to disturb. They are worried about you disturbing the war." If the Canadian authorities are worried about this disturbing of the "peace" in Israel today, as reflected in their media arm, the C.B.C., they're less worried about disturbing the wall. When the issue of its legality was raised at the United Nations, and voted an illegal act that must be immediately reversed by a vote of 150-6, the Canadian authorities took the brave stance of abstention. "When Hamas formed the government of the Palestinian Authority earlier in 2006, the European Union, the United States and Canada suspended aid payments, which among others things, were used to pay civil servants." Among the other things occurring yesterday were reports of protestors shot with "rubber" bullets. Among the injured were a Dane and Australian. Previous demonstrations have included the murder, by Israeli "police" of a Briton, shot in the head by a sniper whilst carrying Palestinian children to safety, and an American woman, run over repeatedly by an Israeli "construction" worker's Caterpillar bulldozer. They were members of the International Solidarity Movement, (ISM), now made targets by the Israeli "police." Among other things, the Israeli air force paid a courtesy call to Canada during last year's now annual Maple Flag military exercises in Cold Lake, Alberta. There, the IDF heroes instructed Canada's air force on ways best to utilize F-16 fighter jets in enforcing urban occupations. They should know; they who last Autumn, before the election of the Hamas "terrorists," terrorized the Occupied Territories, utilizing those same F-16 fighter jets, flying low-level, supersonic sorties over the heads of the inhabitants, leaving blown out windows in their booming wake. That, among other things is too much to mention for the C.B.C. in providing anything resembling context for the Israel/Palestine "conflict." Among other things, the people in Palestine are starving. They have no food, no medicine. Among other things, this is a made in Israel disaster, unnatural and catastrophic. That the C.B.C. 's journalist rarely venture into the Occupied Territories and can forgiven that, given the intransigence of the Israeli government to grant permissions, and proven lethal readiness of the trigger-happy IDF "police" manning the walls of Prison Palestine to shoot journalists, but is it too much to ask they depart the lounges of their comfortable hotels in Jerusalem to do more than make the trip across the street to the Israel Ministry of Information for their news fodder? As the story below indicates, the answer to that is "NO." Much of that unwillingness to cover the true nature of the Palestinian/Israeli may reflect C.B.C. Toronto's discomfort; journalists in the field know, less news is better news at home when it comes to criticizing Israel. So, why risk a lucrative news career actually covering the news? Any authentic coverage of Palestine instantly reveals the gruesome evidence of a systemic campaign of eradication; a campaign of ethnic cleansing; a genocide, and, no-one in Toronto wants to have that albatross hung about their precious necks. The C.B.C. is of course not alone in their cowardice. Western media have consistently massaged the message, buried the truth, and allowed for this monstrous crime's continuity. But, for the most part, those media are commercial interests, free to omit what they wish from their coverage and let the market decide if their product is worthy of attention. The C.B.C. is, on the other hand, paid for by citizen taxes, taxes extracted under threat of imprisonment. If we are to be extorted to support the C.B.C., then is it unreasonable to ask for an alternative to the soap-selling news marketeer's lies, and expect a modicum of reality? Perhaps another fleet of submarines that neither float, nor sink. 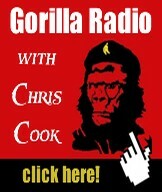 Chris Cook is a contributing editor to PEJ News, and host Gorilla Radio, a weekly public affairs program, broad/webcast from the University of Victoria, Canada. You can check out the GR Blog here. At least 10 people were injured Saturday as Israelis and Palestinians rallied to protest against the construction of Israel's security barrier through an eastern area of Jerusalem. Police used tear gas against the demonstrators as they tried to march together through the Aram neighbourhood. Israel began building the mainly concrete-and-steel wall in 2002 to separate Israeli settlements and the Palestinian population in Jerusalem and the West Bank. By its completion, expected in December, it will stretch for hundreds of kilometres. The barrier has spurred great controversy around the world. Israel says the wall is being built to keep Palestinian suicide bombers in the West Bank from attacking its citizens. The Palestinians have denounced it as a land grab by the Israelis. 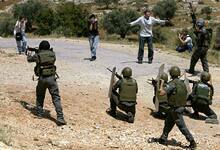 Ten of the activists on Saturday were arrested for disturbing the peace, Israeli Army Radio reported. In a similar protest on Friday, four people were hurt by rubber-coated steel pellets fired by Israel border police in the West Bank village of Bil'in near Ramallah. The injured included two Palestinians, an Australian and a Dane. Also on Friday, Palestinians started donating money to their government to enable the Palestinian Authority to pay its employees. At rallies in the West Bank community of Nablus, thousands of Hamas supporters made a show of handing over cheques and valuables such as jewelry to the cash-strapped government. When Hamas formed the government of the Palestinian Authority earlier in 2006, the European Union, the United States and Canada suspended aid payments, which among others things, were used to pay civil servants. About 160,000 employees have not received any pay since March. Western donors have demanded that the Hamas-led Palestinian Authority renounce violence and recognize Israel before they send aid. The so-called Quartet – the United States, the European Union, Russia and the United Nations – raised Palestinian hopes this week with a proposal to funnel humanitarian aid to Gaza and the West Bank, while bypassing the Hamas-led government. Members of the Quartet will meet in Brussels on Tuesday to discuss a mechanism that will be responsible for transferring humanitarian assistance to the Palestinians. In a related development, India announced on Saturday that it would give $2.2 million US in aid to the cash-strapped Palestinians, in the form of medical supplies. PEJ News - C. L. Cook - Newly forged Canadian Prime Minister, Stephen Harper is peeved with the country's bleeding heart media reports to the people of their fallen fellow citizens overseas. Echoing his philosophical master in Washington, Harper demanded "No pictures, please!" of the sombre casket bearing processions certain to grow only more frequent. Indeed, so frequent are those processions expected to become, Canada's dead young will too pass unmarked by half-mast flags in the nation's capital. Mr. Harper sees no practical use for ceremonies of this nature. Naturally, Stephen Harper is not always miffed at the media, it has proven useful to his [sic] cause for the most part. As Canada's little remarked overhaul of the Canadian Forces under the vacated Liberal government of Paul Martin, the media silence serves still to further Harper's American dream of Canada's [sic] global muscularity, military conquest, and perhaps one day he being referred to as the "Wartime P.M."
As the plan lain out by his Liberal predecessors began to bear its terrible fruit, Canada's [sic] media, led by State television's flagship news program, The National, rushed the breach, inundating the airwaves with tales of the good-hearted intent of our [sic] armed actors sent to Afghanistan. Peter Mansbridge went so far as to obscure the facts of history, reminding Canadians the invasions and occupations of both Afghanistan and Iraq were due to the 9/11 attacks in America. An extra bit of disingenuousness on Pete's part, no doubt to ensure the continuance of his six figure salary. Little mention in the media though, that the majority in Canada opposed "The Mission" when it was strictly an American show; opposed it when the U.N. relented, granting the patently illegal retribution bombing campaign a patina-thin imprimatur; opposed when Canadians followed orders and marched into northern Afghanistan to "reconstruct" the country, once affording it "stability;" opposed as our fellow Canadians, since redeployed to the hot zones in the south and west of Afghanistan began killing and dying more regularly; and oppose it still. As the Globe and Mail reported yesterday, (Sat. May 6, 2006), the Globe being one of the few major media players in the country to seriously question Canada's role in the burgeoning quagmire of Afghanistan, "Support Plummets for Afghan Mission." But for the most part, it's been silence from the fourth estate; a useful silence, from Mr. Harper's perspective. Harper makes no bones about his support of all things Bush. Aping the policies of George W. Bush on media access and flag-dipping for the dead, killed in the wars they share enthusiasm for is not the only similarities der two "leaders" share. Both men reveal a sneering contempt for their respective constituencies, Harper made a career, before his ascension to Sussex Drive, of hammering all things Canadian, and now has the temerity to tell Canadians opposed to the war and continuing occupation of Afghanistan they're too dim to understand the nation's purpose there, and the import of "The Mission." Harper also shares the Bush's belief that the best place for the citizenry is filling jail cells. Parroting the D.C. Machiavelli, Harper now wants to emulate his spiritual guru's expansion of not only Gulag America abroad, but too in bringing home the benefits of a more broadly criminalized electorate to the corporate interests invested in the so-called 'prison-industrial complex,' in the form of the disastrous "Mandatory Minimum" sentencing policies of the U.S. It's a place, no doubt in Stephen's mind to house an indigent population of slackers, as he characterized the nation when addressing his pals from the U.S.-based, Council for National Policy. Harper's generosity seems less limited when it comes to spending billions of public dollars growing his proposed prison industry in Canada. Neither does he hesitate to send troops across the planet, or in doling out billions more for what Canadian Forces honcho, General Rick Hillier says will be a decade-long mission in Afghanistan for Canada. But when it comes to those nasty, Northern European social programs, his purse-strings tighten faster than a sphincter at a border crossing. 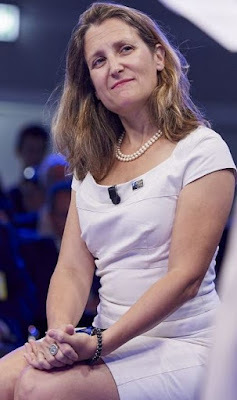 On Medicare a pre-Conservative Harper informed the same gathering: "Then there is the Progressive Conservative party, the PC party, which won only 20 seats. Now, the term Progressive Conservative will immediately raise suspicions in all of your minds. It should... They were in favour of gay rights officially; officially for abortion on demand. Officially -- what else can I say about them? Officially for the entrenchment of our universal, collectivized, health-care system and multicultural policies in the constitution of the country." Stephen Harper's fifth column tendencies were no secret before his minority-election. With approval ratings only George Bush and Tony Blair could envy, Harper has sallied forward, ramming down the collective Canadian gullet mirror image policies of the above mentioned war criminals both at home and abroad. And he's been able to get away with it so far because a complacent public, complicit media, and non-existent "opposition" allow it. And, in that we are all Stephen Harper's, and George W. Bush's, and Tony Blair's useful idiots. Chris Cook is a contributing editor to PEJ News, and host of Gorilla Radio, a weekly public affairs program, broad/webcast from the University of Victoria, Canada. You can check out the GR Blog here.